Farhana Sultana, associate professor of geography at the Maxwell School, is passionate about one of the most basic and important resources on Earth: water. It is through the lens of water by which she examines a multitude of social issues related to access to clean water, including health, education, environmental justice and gender equality. According to the United Nations, 783 million people do not have access to clean water and almost 2.5 billion do not have access to adequate sanitation. Six to eight million people die every year from the consequences of water-related diseases. Due to her decades-long research into water access, Sultana was invited to speak at The Human Right to Water workshop hosted by the Pontifical Academy of Sciences in Vatican City on Feb. 23-24. She was one of several international researchers, humanitarian workers, government officials and corporate leaders invited to present and debate issues about water insecurity and ongoing global efforts to ensure access to clean water. At the end of the two-day workshop, Sultana and the other participants were part of a small audience to hear Pope Francis speak about the issues of water insecurity and the human right to water. The Pontiff reinforced the importance of ensuring global access to clean safe water by working concertedly to implement the human right to water everywhere. 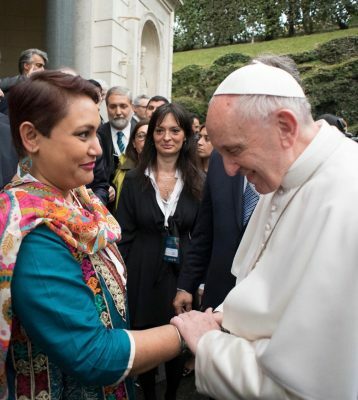 Farhana Sultana with Pope Francis. Afterwards, Sultana met and spoke with Pope Francis. She gifted him a pair of handwoven baskets made by women in a craft cooperative in Bangladesh, a country where she has been carrying out field research during her sabbatical for the spring semester. During the workshop, Sultana’s presentation focused on the importance of linking the human right to water to gender rights. She also stressed the importance of raising awareness and education on these issues, as water affects all aspects of societal development and environmental sustainability. At the conclusion of the workshop, the Vatican Declaration on the Human Right to Water was signed by Pope Francis and is now an official document of the Vatican. Sultana is a co-signatory of the document. “One of my contributions to the document was having the importance of women and vulnerable people be incorporated into the text,” says Sultana. Sultana says the trip to Rome to participate in the workshop has not only informed her ongoing work but also showed her the beauty of the Vatican—the participants had access to parts that are not open to the public.